My daughter Cheryl and I recently spent a week-end cooking non-stop at Jane Butel's Cooking School in Albuquerque, New Mexico. 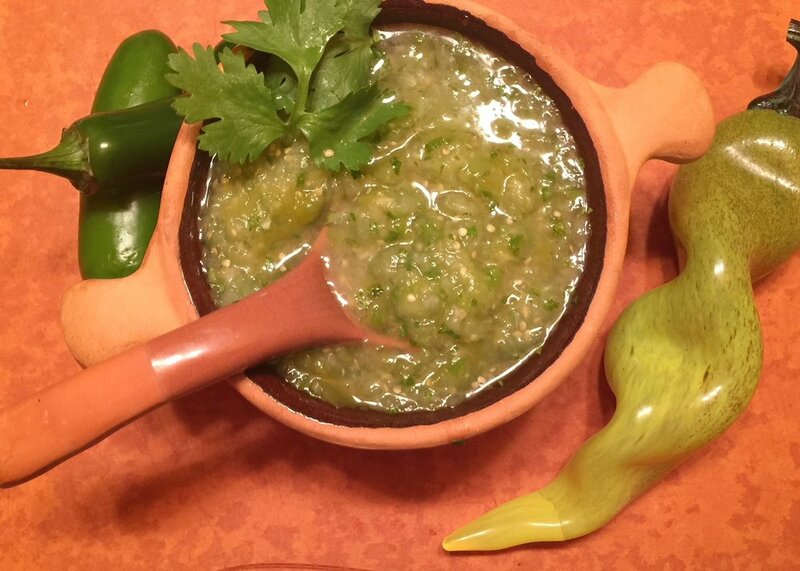 One of our favorite take aways is this simple salsa which consists of only 4 fresh ingredients--tomatillos, cilantro, jalapeño and onion. This bright, punchy green sauce is not spicy, (although you can add as much heat as you like). it's fruity, herbal, clean flavor is what makes it so special. 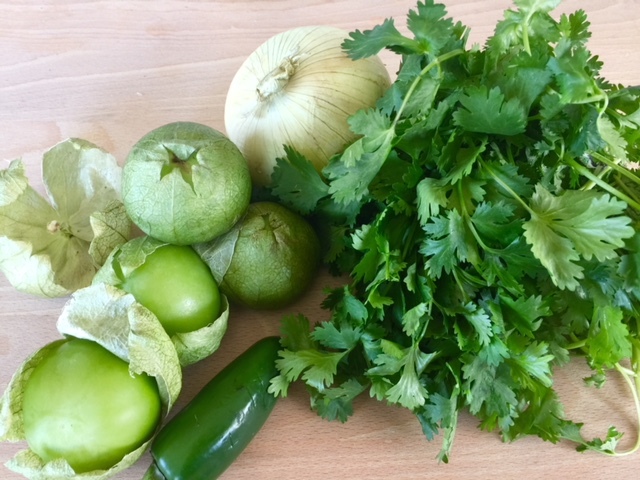 In one of my recent blogs, I included a recipe for a Green Gazpacho using tomatillos. (For the gazpacho recipe, click here.) In the gazpacho, the tomatillos are pureed raw, so they add a fresh citrus-like flavor. In this salsa, they are cooked by parboiling them, which mellows their flavor. They have quite a bit of pectin, so the salsa gets slightly gelatinous when chilled, but stirring thins it out. 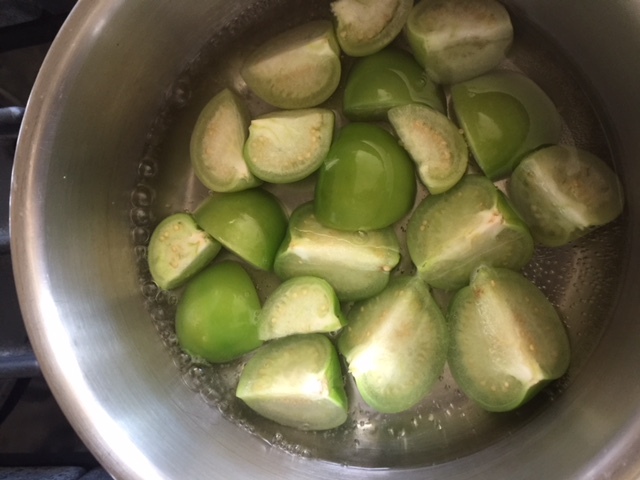 Tomatillos come in various sizes from ping pong balls to tennis balls. Rather than suggesting a number to use in the recipe, I suggest packing them into a liquid measure. A few too many won't change much, just adjust the jalapeño to taste. Salsa Verde's acid and herbal notes add a touch of fresh zing to any grilled meat, think flank steak, chicken, pork chops, lamb. It is a great addition to scrambled eggs and omelets, as well as an ideal seasoning for rice. It is also a terrific accompaniment to roasted or grilled veggies and of course, it is a natural for any Mexican dish like chilaquiles, enchiladas (especially chicken) and tacos. Often times I like to supplement it with a second salsa that has more heat, like Salsa Roja or Pico De Gallo. Tomatillos, onion, cilantro and jalapeño, only 4 fresh ingredients. Cut into quarters or eighths, if large. Do not boil more than 5 minutes or they will lose too much favor. Add onion, cilantro, chili and salt and process to combine, making it as chunky or smooth as desired.. Adjust salt and heat level to taste. To Make Ahead:: Salsa can be refrigerated in an airtight container for several weeks. Its pepper-heat level may diminish slightly over the course of several days. Sign-up to receive Marlene's newsletter. We respect your privacy and will not sell or distribute your email address.